Find the best deal for the board game Pathfinder Adventure Card Game: Rise of the Runelords - Sins of the Saviors Adventure Deck. The following stores have the game listed. Shipping is calculated based on the weight of the item being 267 grams. All prices include VAT. The shown information is as reported by the individual stores. BoardGamePrices.co.uk is not responsible for any errors in the shown information. More information. 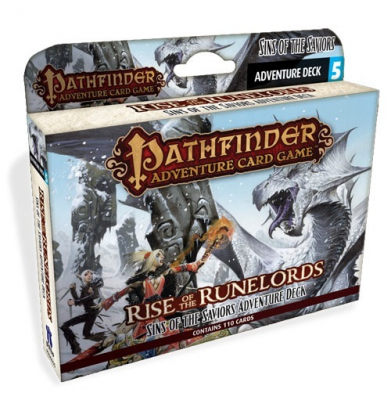 If you would like to be notified, when Pathfinder Adventure Card Game: Rise of the Runelords - Sins of the Saviors Adventure Deck is in stock, you can enter your e-mail here. We will send you a mail, once Pathfinder Adventure Card Game: Rise of the Runelords - Sins of the Saviors Adventure Deck is in stock in at least one store. We will not use your e-mail for any other purpose than sending you this one e-mail.